Dry flaky skin is naturally occurring in some people. 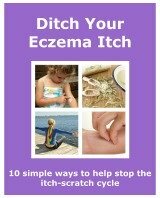 When we have eczema we are likely to have extremely dry skin. If we have eczema in certain areas, the unaffected areas are not likely to be as dry. It is still advised to look after these unaffected areas too. They need regular moisturising, to keep it healthy. Looking after the skin is key. Every now and again I get a small patch on an area previously unaffected. So its a good idea to moisturise, regularly using emollients, on all of your body. Your skin's dryness reduces the protective layer of the skin. It makes it less effective at protecting against heat, cold, loss of water and bacterial infection. A mild case can be recognised as it has a dehydrated look. It look and feels rough, and there may be some mild flaking. If you have extremely dry skin it may feel tight. You may appear to have dry cracked skin. The cracks may cause some bleeding to occur. Our skin has its own elasticity. Allowing it to stretch and move as you do. The drier it is the less flexibility it will have. The more damage this causes. If your skin is healthy, it releases an oily substance called Sebum. Sebum keeps the skin moist, supple and waterproof. Along with natural oils (lipids) and moisturisers, sebum forms a barrier on the surface that keeps irritants out of your body and water in. When your skin isn't moisturised properly these natural oils aren't produced enough. The barrier becomes deficient, unable to do its job. This often happens to babies and children. This is because their oil-producing glands haven't fully developed. In adults, dry flaky skin is more often caused by external or environmental irritants. This is a reason why most people first get eczema as a child, then are still affected by it as an adult. As a child their skin becomes unable to do its job, then as an adult it is affected by allergies and irritants. One of the problems that arises from dry skin is the breaking of the skin. You have probably had dry cracked skin appear on certain areas. For me it is on my knuckles and on the side of my hand. It tends to be on areas of the body that bend. As the skin dries and loses its elasticity they don't move as well as they should. Damage occurs and the breaks appear. These tears in the surface can allow the irritants and allergens in, increasing the chance of infection. It also allows fluids to leave, drying out the skin further. The best way to treat skin dryness is to moisturise it like your life depends on it....well like your skin depends on it! Use emollients regularly, especially after contact with water. They need to be used all the time, not just when you have a flare up. The other thing to do is not to scratch. Dry itchy skin is more itchy than healthy skin. Scratching can cause further damage to the skin, making it harder to manage and treat.